The Countdown is On to the UK Premiere Tour Of New LET IT BE Show Broadway World . Beatles Radio: The Beatles, Solos, Covers, Birthdays, News The Fab 4 and More! The countdown is on until Let It Be opens in Cardiff in three weeks, when fans will be able to see the new show in the UK and Ireland for the very first time. The smash-hit stage show has been updated to feature a brand new Let It Be Part II - which has never been seen before in the UK - and returns to stages across the UK and Ireland for a new national tour starting in Summer 2018. The new second half is set a decade after The Beatles went their separate ways. 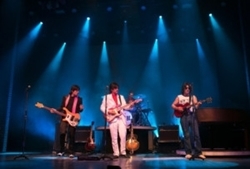 It gives fans a rare glimpse of how the Fab Four could have performed together once again. The concert that never was.